Democratic Candidates Stumble Over Black Lives Matter Movement : It's All Politics "Nobody got the messaging right at the beginning," one activist said. "They should have known better." Three Democratic candidates are speaking to the National Urban League today. Black Lives Matter activists confronted Democratic candidates Martin O'Malley and Bernie Sanders at a Netroots Nation event earlier this month. O'Malley used the phrase "all lives matter" twice, which he later apologized for. Members of the Black Lives Matter movement are making sure the presidential candidates don't take their votes or their concerns for granted. The candidates are being confronted with activists who are responding to a string of deaths of African-Americans at the hands of police. Democrats have traditionally won strong margins with black voters and that is unlikely to change in 2016. But in recent weeks, the Black Lives Matter movement has been a stumbling block for the Democratic candidates. Former Secretary of State Hillary Clinton and Maryland Gov. Martin O'Malley each used the phrase "all lives matter" in this early campaign. And Vermont Sen. Bernie Sanders has said, "Black lives matter, white lives matter, Hispanic lives matter." For those at the heart of the Black Lives Matter movement, these words hit the wrong note. "All lives matter" is a phrase adopted by those who seek to minimize or criticize the movement. "Nobody got the messaging right at the beginning. They should have known better," said DeRay Mckesson, a former teacher who has become a full-time organizer in the Black Lives Matter movement. He is among the activists the Democratic campaigns have courted. "If they plan to be president, black people are a constituency that they will not be able to take for granted and will need to speak to directly and speak to issues that black people face directly," he said. Democratic candidates could risk turning off white working-class voters by aligning too closely with the Black Lives Matter movement. But Mckesson says the movement can't and won't be ignored. "People will choose to stay home, people will opt out of the process completely if the platforms don't speak to issues that face them," he said. 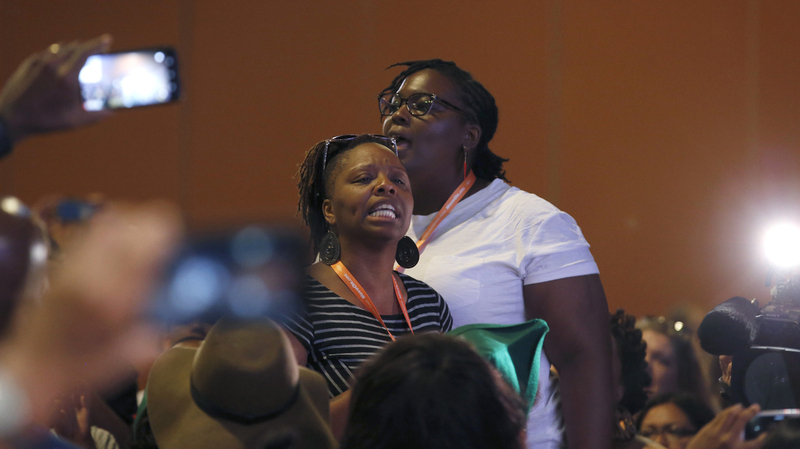 Earlier this month at the Netroots Nation conference in Arizona, both O'Malley and Sanders were confronted by protesters chanting, "Black lives matter." Clinton wasn't there. That's where O'Malley used the phrase "all lives matter" — not once, but twice. This compounds concerns that activists already had about policing tactics implemented when he was mayor of Baltimore. After leaving the stage, in an interview with This Week in Blackness, O'Malley apologized for using the phrase. "That was a mistake on my part. And I meant no disrespect. And I didn't mean to be insensitive in any way," he said. All three candidates have since adjusted their rhetoric. Sanders, at the Southern Christian Leadership Conference, said, "We must reform our criminal justice system. Black lives do matter. And we must value black lives." And Clinton, speaking in South Carolina, said, "I think it is essential that we all stand up and say loudly and clearly, 'Yes, black lives matter.' "
All of the Democratic campaigns have held meetings with activists from the movement. "Rhetoric is important and language matters," said Brittany Packnett, a Ferguson protester and a member of the president's task force on policing. "But at the end of the day you're going to show me that my life matters by what you plan to do and by following through on that plan." Packnett has a lot of questions for the candidates and they go well beyond the words they choose. "I want to know what your goal is to decrease the prison population," she said. "I want to know what your goal is to increase graduation rates in marginalized communities. I want to know how you are going to decrease police killings. And I want to know what your goal is to increase employment in marginalized communities. How and when you will be making that happen." All three major Democratic candidates and some on the GOP side are speaking at the National Urban League conference in Florida today. O'Malley is unveiling what his campaign describes as a comprehensive criminal justice platform. The activists say they can't wait to scrutinize what all of the candidates are proposing.